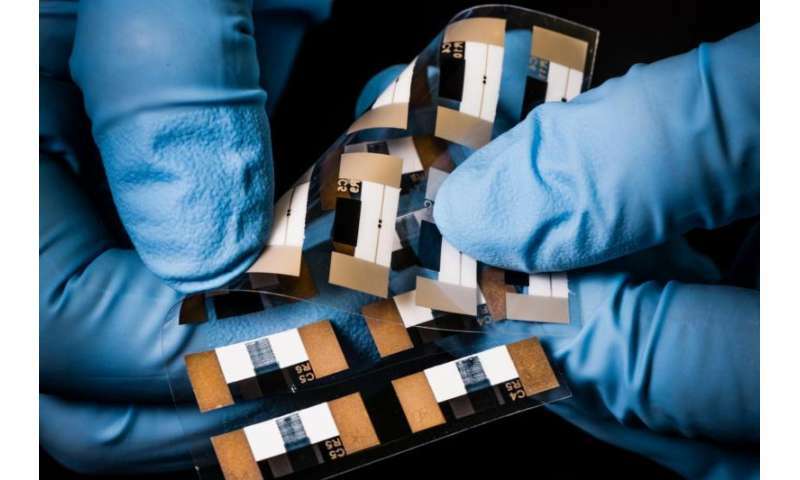 Printed electronic transistor circuits and displays in which the colour of individual pixels can be changed, are two of many applications of ground-breaking research at the Laboratory of Organic Electronics, Linköping University. New groundbreaking results on these topics have been published in the prestigious scientific journal Science Advances. The researchers in organic electronics have a favourite material to work with: the conducting polymer PEDOT:PSS, which conducts both electrons and ions. Displays and transistors manufactured from this polymer have many advantages, which include that they are simple and cheap to manufacture, and the material itself is non-hazardous. It has, however, been difficult to create devices that switch rapidly at a specific voltage, known as the "threshold voltage". This gives that it has, so far, been difficult to control the current state of the transistors or the color state of the displays in a precise manner. "The lack of any threshold in the redox-switching characteristics of PEDOT:PSS hampers bistability and rectification, characteristics that would allow for passive matrix addressing in display or memory functionality" says Simone Fabiano, senior lecturer at the Laboratory of Organic Electronics, LOE, who is the principal author of the article in Science Advances, together with Negar Sani from the research institute RISE Acreo. More than five years ago a wild idea arose at the Laboratory of Organic Electronics: could you solve this problem by combining electrochemistry with ferroelectricity? Ferroelectric materials consist of dipoles. One end of a dipole has a positive charge and the other a negative charge, and these "ferroelectric" dipoles rotate when they are exposed to an electric field beyond a specific threshold. Head of the laboratory Professor Magnus Berggren couldn't let this idea rest, and when he was awarded a research grant from the Knut and Alice Wallenberg Foundation in December 2012 to use freely, this was one of the high-risk projects he chose to invest in. "We called the research then breakneck research, and here is a result. Our demonstration proves that truly leading research typically take a long time and require considerable patience. Simone Fabiano has done tremendous work here, and refused to give up when others have doubted," says Magnus Berggren. After many years of tenacious experiments, Simone Fabiano and his colleagues at the Laboratory of Organic Electronics have managed to apply a thin layer of a ferroelectric material onto one electrode in organic electrochemical devices and circuits. "The thickness of the layer determines the voltage at which the circuit switches or the display changes colour. Transistors are no longer required in the displays: we can control them pixel-by-pixel simply through a thin ferroelectric layer on the electrode," says Simone Fabiano. The LOE research group shows in the article that "ferroelectrochemistry", the combination of ferroelectricity and electrochemistry, can be used in displays in the field of printed electronics and in organic transistors. The scientists envisage, however, many other areas of application. "Ferroelectrochemical components can easily be integrated into memory matrices and into bioelectronic applications, just to give a couple of examples," says Simone Fabiano. The technology is now protected by patents. "The field of ferroelectrochemistry doesn't actually exist, but we have achieved success using this combination," Magnus Berggren concludes.